I’m a fan of the odd, the unusual, the out of the ordinary, but when you combine that with some history, I’m hooked to the point of obsession. North Africa, or alternatively the southern coast of the Mediterranean Sea, has seen its share of invaders and occupiers, most of which came from across the selfsame sea. The Phoenicians, Carthaginians, and Romans were here, as were the Arabs, or course, but more recently, within the last century, the area was occupied variously by European powers such as England, Germany, Portugal, Spain, and France. Even Italy wanted in on the action. Ultimately, the French and Spanish prevailed and divided the country into different spheres of influence with the Spanish having the north and south while France occupied the middle. The exception being Tangier which, for all intents and purposes, was an international zone. Eventually, the occupiers left. The French, though they left their language, ceded the whole of their claims to the country back to Morocco, The Spanish, however, gave back only 99%. They kept little bits and pieces along the coast. Morocco, to no one’s surprise, disagrees with Spanish claims and argues that the land should be given back to them as was the rest of their former northern claims. They are fond of comparing the status of Gibraltar, a territory of the United Kingdom, which has long been s thorn in Spanish pride. 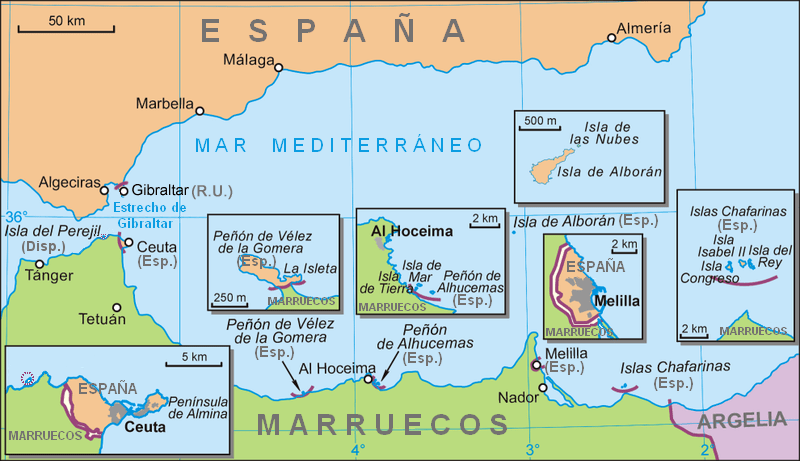 Spain did return a small southern, coastal claim, Sidi Ifni, (See the Ifni War) in 1969 after increasing tensions in the area and due to international pressure, but the littoral areas remain Spanish as does a small island in the middle of the sea between the two countries. The Spanish Sahara, now sometimes called the Western Sahara, was relinquished to Morocco after the Green March in 1975 in which “some 350,000 Moroccans advanced several miles into the Western Sahara territory, escorted by nearly 20,000 Moroccan troops…” (Wikipedia). More recently (2002), there was a minor crisis between the two countries surrounding Perejil Island which Moroccan soldiers occupied and which Spanish commandos retook without casualties. 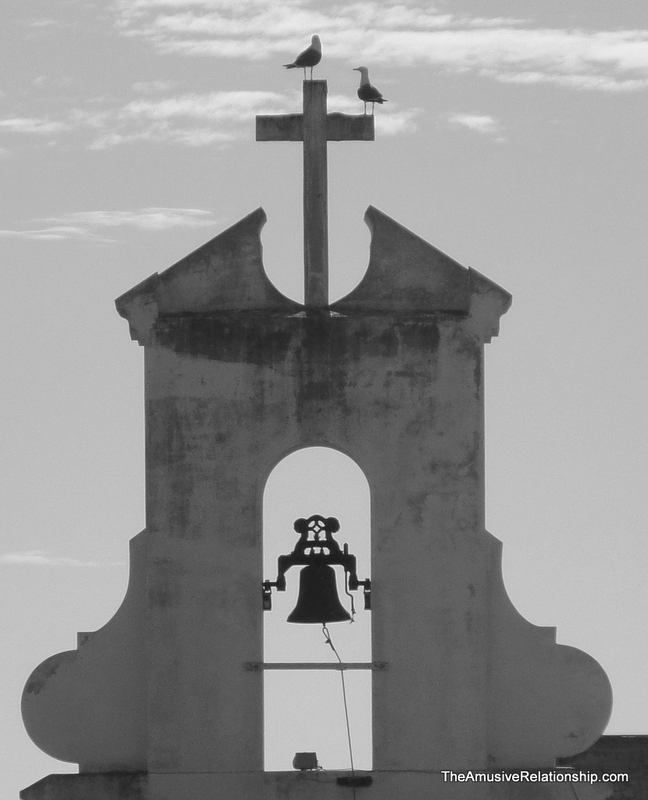 The bell on the old convent. 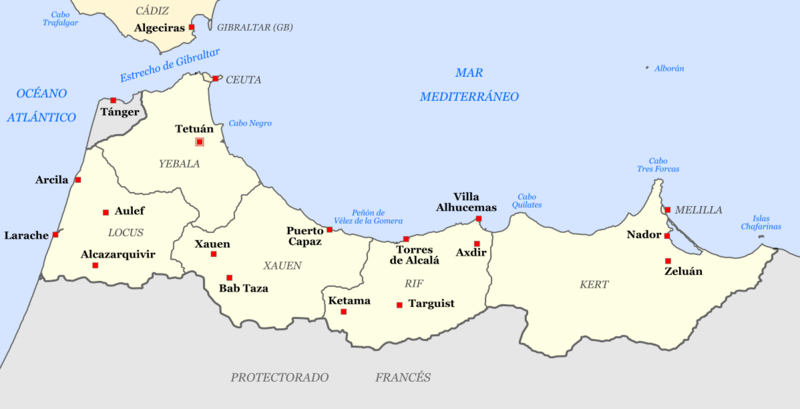 The population of Melilla, in speaking with locals, is divided roughly 50/50 with people of Spanish decent and people of Rif Mountain Amazigh (Rifian) decent in fairly equal proportions. Thankfully, since I don’t speak a lick of Spanish, I was able easily find Arabic speakers when I needed help or directions. In fact, it was a bit surreal. Here I was ostensibly in Spain, but surrounded by what looked like everyday Moroccans in both dress and complexion. It was the best of both worlds. Being on the African continent has its challenges as ell. Both Melilla and its sister city Ceuta have become focal points for refugees seeking asylum.Refugees from sub-Saharan Africa and the Middle East come seeking sanctuary in Europe through the gates of the cities, as was mistakenly made famous by Donald Trump in a rant about immigration in America. 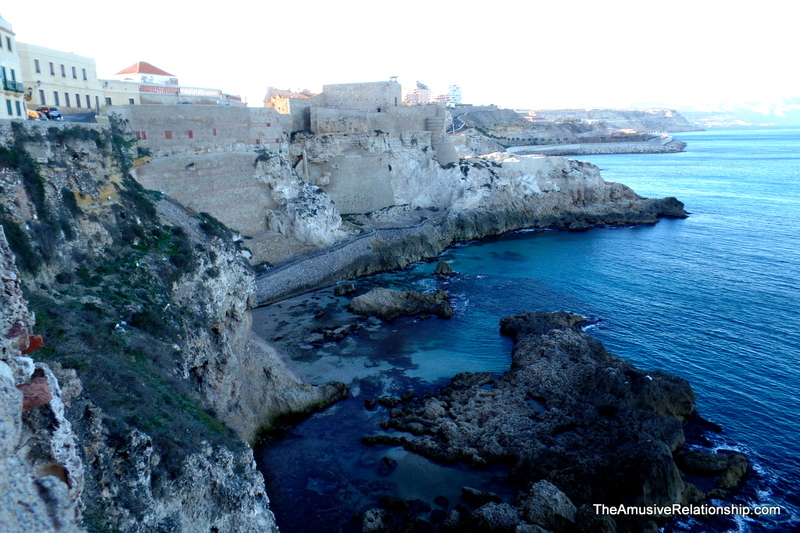 Being a strategic peninsula, Melilla is dominated by an ancient citadel, or fortified city, overlooking the sea from a craggy outcropping of stone. Over the years, it has grown and been added to in six distinct phases, each with its own architectural touches. The museum I went to showed each stage and highlighted each variation. It was a nice little museum that dedicated an entire wing to Sephardic and Amazigh heritage. I met and spoke with one of the curators, an Amazigh, who was very helpful in showing me around. In fact, the entire citadel is quite well-preserved and interesting. There are large, cavernous cisterns for holding water in ancient times, an archaic chimney jutting up from the shore, an old, though functioning, drawbridge, as well as extensive cave systems used by nuns who lived in the convent and in which they would spend the time in contemplation. It was quite impressive, but best of all is that it’s completely free to visit and see all the areas, even the museums, such as the military museum. 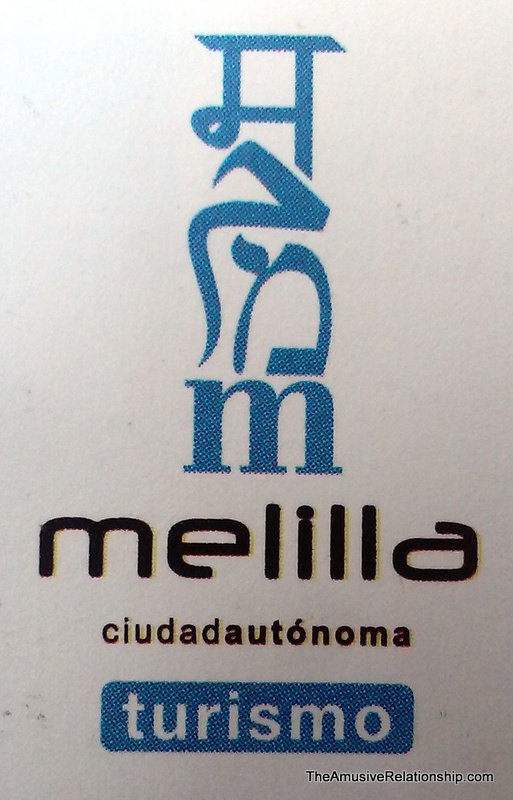 The official imprint of Melilla that honors its multifaith population living in harmony. Perhaps the best part of Melilla, since it is steeped in Spanish cuture, is the tapas. Across from my hotel was a little tapas bar that for between €5-10 I could get four or five delicious tapas and a few beers. I had intentions to dine out for a more formal birthday dinner, but I was more than contented visiting the various tapas offerings than blowing a wad of cash on something fancier. And Hell, it was my birthday, after all. 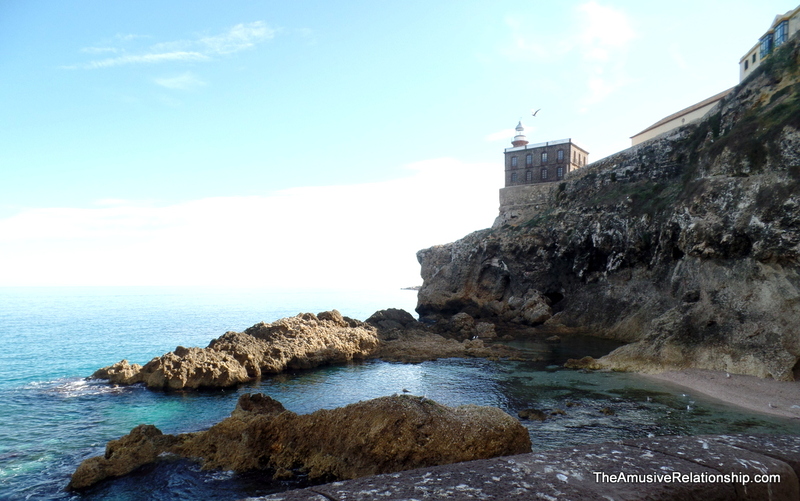 Not really Spain and not really Morocco, Melilla is a wonderful little anomaly not to be missed. Despite its divergent cultures, its people live in harmony. Most telling of this, perhaps, is in the city’s official logo. In it, one can see a melding of the four dominant religions within the city. (See left) Above the city name are the four sounds of “m” in each of the four languages, Hindi/Sanskrit, Arabic, Hebrew, and Spanish. It’s a beautiful town. There are lovely beaches, great food, and plenty of interesting history. Many houses have tiles above their doors.